Lets you & others rez & ride scooters, which use no prims & disappear after use! Allows your visitors (and you!) to rez & ride scooters around your land. Scooters "temp", so use no prim space, and disappear after use: no litter! Offers 18 styles of scooter & allows you to add more, with your own textures. Rez as many scooters as you like: no charges after you've bought the rezzer! Copyable: place as many rezzers as you like in as many venues as you like! Rez the "Bright Scooter Rezzer" anywhere, and it's ready to go. A 3 prim sign, it advertises "free scooter hire". Your visitors (and you!) can click "<" & ">" buttons to display pictures of 18 different "styles" of scooter, and then click a picture to rez. Their scooter appears instantly, and they are invited to "right-click and choose "RIDE!". Because the scooter is a "temporary" object, it isn't deducted from your prim allowance. If they don't ride it, it simply disappears after a minute, leaving the rezzer free for the next user. But if they do, it will remain rezzed for as long as they wish: they can ride all day if they wish. And when they've finished riding and "stand", it disappears: leaving no litter. The scooter is a Bright Vela: a classic, highly detailed vehicle with 5 gears, RL scooter engine sounds, spinning wheels, even exhaust smoke. It has a simple menu system, allowing riders to resize it, control engine sound... even further modify the colour and textures. You can configure the choice of scooters styles offered if you wish: add your own, or remove those you don't like. 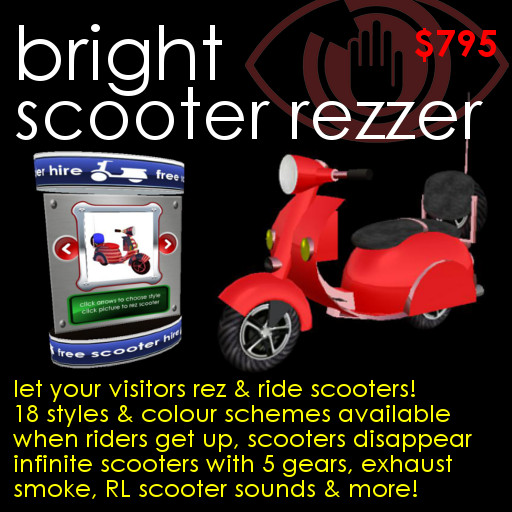 Above all, the Bright Scooter Rezzer adds value to your venue: it's fun, it's free to use, and it will attract and entertain visitors. And it's the perfect way to encourage travel around your entire site. Love your visitors, love your site: set up a Bright Scooter Rezzer! First rez a scooter, get on, and click it to display its menu. Click [PAINT] and choose the parts of the scooter in turn, selecting textures, colours, and levels of shine. When you have it looking how you like, take a snapshot, and save it in your inventory. Now right-click the rezzer, click "Open" to list its contents, and double click the STYLES notecard. Copy an existing entry, and paste it anywhere into the list, giving it a name to help you remember which it is. The key before the "=" sign is the UUID of the texture displayed by the rezzer. Open your inventory, right-click the snapshot of your new style, and select "Copy Asset UUID". Then paste it over the old key. Change the words after BODY, TRIM, TOOLBOX and so on to reflect the textures, colours, and shine levels you've chosen for each part. If you want to use a texture which isn't on the Vela's menu, use the texture's key in place of a texture name. Finally, save the notecard, and the rezzer will restart. Choose your new style, rez it to check it looks as you expected, and you're done!